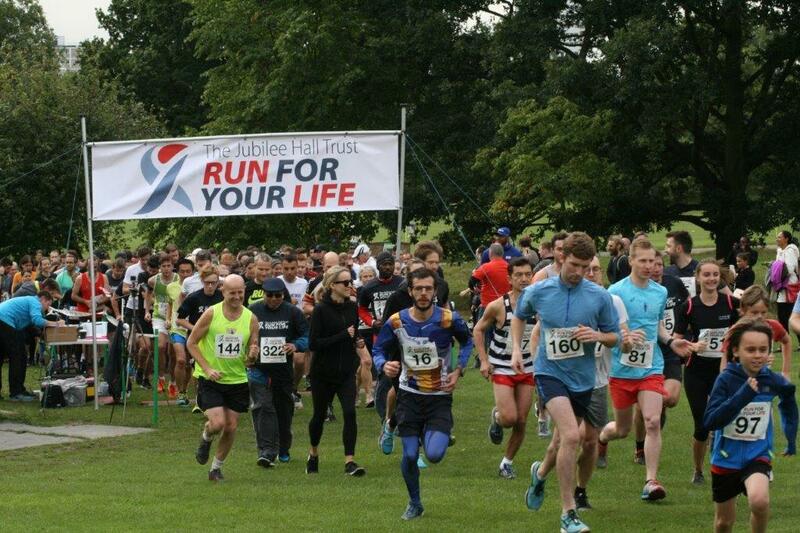 Jubilee Hall Trust’s 3rd annual Run for your Life event held on Hampstead Heath on Saturday 16th September, was a huge success! We had 314 participants taking part in one of the three different distances of 2k, 5k and 10k trail runs, which was a significant increase on last year’s 225. Runners included a couple completing their first ever 2k, families participating for the 3rd year in a row and 50 Parkrunners. There was a great atmosphere on the day, and lots of positive comments from those taking part. The event was started by our Athlete Ambassador, Team GB Triple Jumper, Nathan Fox, who was also there to provide inspiration to the runners. Wellness services, including very welcome past-race massages, were provided by our event partners, Breathe London, and their tent was packed throughout. A wonderful occasion thanks to a dedicated team of sponsors, volunteers and runners. Special ‘thank yous’ to Stuart and Chloe from The Armoury, Ahmed from Westminster, Julien (PT) from Jubilee Hall and Louise, Phil and Liz for volunteering. It was a brilliant event, superbly organised by our Community Programmes Manager, Malorie. We raised funds for the British Heart Foundation’s Move It: Beat It campaign and we are still adding up the money!